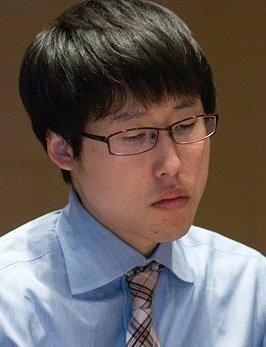 Iyama Extends Lead in Honinbo Title Match: Ida Atsushi is an aggressive player and Iyama Yuta’s philosophy is to always look for the strongest move, so the 69th Honinbo best-of-seven is proving to be an exciting title match. The second game was held in the Old Inn Kaneyu, a traditional building that is nationally registered as a Tangible Cultural Asset, on May 25 and 26. Taking black, Ida set the tone of the game early when he chose an attacking move with Black 39 rather than a defensive one. If his move worked, he would swallow up a white group that was trying to reduce his main potential territory, but if it failed that territory would be ruined. Ida followed up with more attacking moves, so his play was consistent, but his 45th move was “probably an overplay,” according to Takao Shinji. Iyama (right) needed to secure a second eye for a cut-off group, but he counterattacked for over 50 moves before doing so. By the end of the fight, he had split Black into two weak groups in the centre while he had only one weak group. The pressure finally got to Ida on move 91, a mistake that overlooked a brilliant counter by White. Thereafter, Iyama took control of the game and, as usual, ratcheted up the pressure instead of coasting to a win on territory. Ida resigned after White 182. This game is full of brilliant tesujis accessible to players of all levels, so if you have access to it on the Net we recommend you play through it. Perhaps the highlight is a three-step hane by Iyama that gives Black a double atari, but ironically one that helps White more than Black. After the game, Ida consoled himself with the reflection that he was at least getting more used to two-day games. However, I can’t help wondering if he is using his time allowance effectively. In both games, Iyama was in byo-yomi, being down to his final three minutes, whereas Ida had 70 minutes left in this game and 55 minutes left in the first game.Two sidelights: This was the first time a Honinbo game was held in Aizu Wakamatsu for nearly half a century, the predecessor being the second game of the 20th title match between Sakata Eio Honinbo and Yamabe Toshiro. At the party held on eve of the game, Iyama was presented with a cake in a surprise celebration of his 25th birthday. He looked after his present himself. The third game, scheduled for June 4 and 5, is going to be a test of Ida’s mettle. To avoid being forced to a kadoban, he will have to beat Iyama with White, not an easy task. Fujisawa and Okuda Reach Final of New Women’s Tournament: Few things would make Japanese go fans happier than to see Fujisawa Shuko’s granddaughter Rina (left) develop into a top player. She is already showing signs of potential, having reached the final of a new women’s tournament, the Aizu Central Hospital Cup. As the name shows, this tournament is sponsored by a hospital in Aizu Wakamatsu City in Fukushima Prefecture, the region which suffered the heaviest earthquake damage three years ago. The director of the hospital is a keen go player, and in an interview he said that at one time 20 of the doctors on the staff were go players who often held their own tournaments. His aim in sponsoring the tournament is to help raise the level of Japanese women so that they can compete better internationally. Most of the tournaments with regional sponsors that we report on are minor events, without substantial prize money, but this tournament is a serious affair. First prize is seven million yen, the top prize for a women’s tournament, and the final will be a two-day game June 26 and 27, which is a first for a women’s tournament. All 62 women players at the Nihon Ki-in and the Kansai Ki-in took part in preliminary rounds held during late January and early February to select seven finalists for the main tournament. Dual title-holder Xie Yimin was seeded in the eighth place. The quarterfinals and semifinals were held at the Konjakutei Inn in Higashiyama Hot Spring in Aizu Wakamatsu City on May 24 and 25. Results follow. Quarterfinals (May 24): Fujisawa Rina 2P (B) defeated Xie Yimin, Women’s Meijin & Kisei, by 2.5 points; Mannami Nao 3P (B) d. O Keii 2P by resig. ; Okuda Aya 3P (B) d. Koyama Terumi 6P by 5.5 points; Ishii Akane 2P (B) d. Kato Keiko 6P by resig. Semifinals (May 25): Fujisawa (W) d. Mannami by resig. ; Okuda (B) d. Ishii by resig.